Hayward’s best-selling Super Pump just got even better! Super Pump® VS variable-speed pool pumps are a drop-in upgrade that delivers up to 80% energy cost savings over single speed models. Designed for small to medium pools, Super Pump VS pays for itself faster than larger, more expensive models. Hayward’s best-selling Super Pump just got even better! 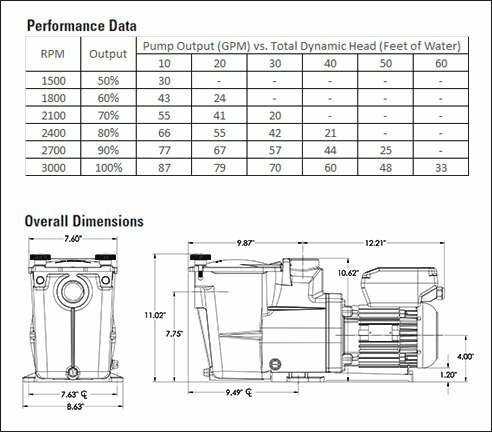 The new variable-speed Super Pump VS takes efficiency to the next level with up to 80% energy cost savings over traditional single-speed pool pumps. The Super Pump VS provides customizable speed, duration and priming time to match the needs of both aftermarket and new construction installations. Programmable timers and a totally-enclosed permanent magnet motor mean this pump meets the requirements of swimming pool efficiency standards such as Title 20 and APSP-15. Upgrade to the Hayward Super Pump VS and save energy and money! • 110 Cubic-inch Basket - Extra leaf-holding capacity. • Integrated, Programmable Interface - Customize speed, duration, and priming time while monitoring power consumption.The digital interface shows power consumption for immidiate feedback to maximize energy savings. • Advanced Motor design - Permanent magnet, totally-enclosed fan cooled (TEFC) design provides incredible energy efficiency and reliability.